I’ve been remiss in posting this little story, but I have to share it. 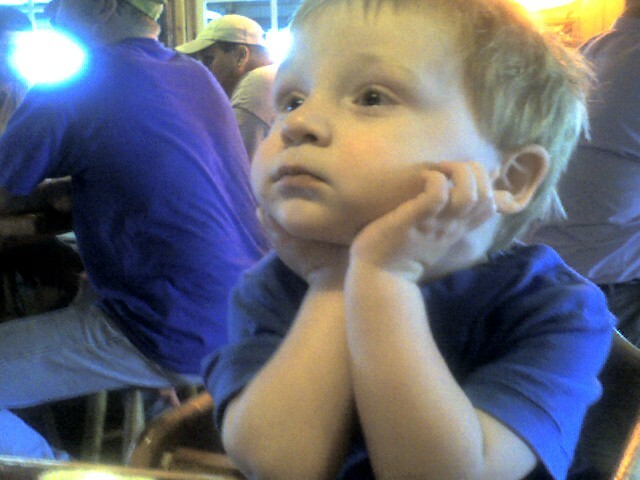 I took my son to Hooters for the first time a few days ago. For those of you who don’t know, he’s two years old. We were there with my friend John, who is an expectant father (that phrase has always put an absolutely silly image in my head). Anyway, were sitting at the table waiting on our scantily clad server talking about fatherhood and trying to keep Ian from eating the napkins. In hindsight, I noticed early on that he was watching one particular blonde, well-endowed server every time she passed by our table. She was not our server, but every time she passed by our table he would stare at her and yell “HI! !” as she walked by. My son’s hand reached slowly out for her nametag. She didn’t see it coming because she was focusing on John who’s eyes were on the menu. I, too, was looking at the menu, but as fatherhood dictates, I kept the menu low enough to allow a peripheral view of my son. He grabbed her nametag and held it with a death grip. As she pulled away, this caused her shirt (which was already under a considerable amount of stress and strain) to pull away from her body. When she put her hand up to stop the impending revelation, he tried to grab on to her arm to climb into her arms. Thankfully, he was strapped into his high chair because he would have been in her arms. When my son wants something, he will fight tooth and nail to get it. He didn’t get what he wanted, but he got a show out of the attempt. Now, let me say that she was well covered underneath the shirt, but her shirt was pulled far enough away to see pretty much anything that anyone wanted to see. We all three jumped into getting my son’s arm under control and weren’t dealing with the other issue of the exposure. When the nametag finally slipped from the deathgrip my son had on it, her shirt slipped back into place with only some minor adjustment needed to get it back into place. There was an awkward moment where we were all not sure what to do next. Luckily, all three of us laughed at pretty much the same time. The rest of the meal went off pretty much without a hitch, but my son looked like this for the rest of the time. For those of you who know my daughter very well, you know that she has had a blanket that her Ma-Maw made her since the day she was born. She has slept with it every night of her life and it is essential that we make sure that we know where it is at all times. As such, “Blankets Hearts” (so dubbed by Her Royal Highness) has (already) seen better days. It was starting to develop a few holes near the edges. Blankets Hearts is approximately 3’x2′. It’s mostly a white piece of cotton flannel with a pattern of tiny hearts of varying colors (mostly pinks and purples). The trim is pink satin that is absolutely perfect for rubbing between your fingers for that “made with love” comfort feeling. Today, we had to send Blankets Hearts back to Ma-Maw (under my daughter’s close supervision) to be repaired. However, when I picked her up this afternoon, I was surprised to find Blankets Hearts 2.0 in my daughter’s possesion. Just wanted you two to know about Morgan’s heart blanket. …we were at Wal Mart in fabric section. She saw the hearts fabric just like her blanket!!! So I talked her into me making her a new one but this time she picked out for it to have purple (really lavender) trim. She was so cute hugging and kissing the fabric. So when we got home we made it. Yes we made it. I showed her how to step on the sewing machine pedal and I would say “go” and she’d put the juice to the pedal and then when I said “stop” she’d stop. We had the best time and has sparked in her to sew. I told her she had to be 6 years old before she could do it by her self. Any way I talked her into leaving old blanket here and took new one home. So, tonight is the trial run with the new blanket. She has been perfectly happy with the blanket so far and I’m sure it will continue to help her through the night. I may be posting something in the middle of the night if it doesn’t work out. Okay, I know this is late, but in my ADD-riddled world, this has been floating around in my head since Saturday night. And, I wouldn’t trade any of it for any amount of wealth in the world. On one hand, fatherhood is everything I’d ever hoped for and more. On the other hand, there’s no way to know what to hope for with fatherhood. It’s another step in the journey and I’m proud and humbled by the fact that someone actually chose to take that journey with me and has never faltered on any step of the path. We’ve gotten to one mountain top only to find that there is an entire chain of mountains waiting to be climbed. Every day brings us closer to another of those mountains. Believe it or not, I now have fewer gagets in my life. According to one of my colleagues on campus, Batman kept calling asking for his belt back. Anyway, we switched to Verizon yesterday and I got the new Smartphone. My former students will get a kick out of the fact that it’s called the “Q”. So, this is a test of my capbilities with my new toy…er…phone. You have what is quite possibly one of the bravest shows on television. And, I’m not just saying that because you actually put yourself on television every night. I’m saying that because you put yourself on television and have the audacity to be completely open and honest and only do stuff that comes straight from your heart. Thank you. My wife and I are huge fans of both shows, but last night you took a huge chance with one particular segment and you lost our audience. You started talking about “Sam I Am” and your son. Before you jump to conclusions, let me paint this picture for you. I, too, am a pasty, fluffy white guy who happens to be one of the luckiest men on the planet. I have a beautiful wife and two amazing and gorgeous children who love me regardless of how stupid and male I can be sometimes. I also have a great job: I’m a university theatre professor (don’t jump to any conclusions…that’s a topic for another time). That means that this summer, I’m getting to stay home with my children while my wife has started her new job. We’ve gone through some pretty trying financial troubles in the past years and, unfortunately, we both have to work which means putting the kids in daycare. However, when the opportunity presented itself for me to stay home with this this summer, we jumped on it. It also means that I’m a Stay-At-Home-Dad this summer and I’m in charge of all things domestic (may God have mercy on my wife’s sanity). Last night during your show, we had all four just finished dinner (which we usually eat while your show is on) and were sitting back enjoying the show after a meal that I cooked for my family and you started the segment on spending time with your son and reading to him. We couldn’t finish the show. I have no idea how your show ended or what the segment was really about. My wife and I looked at each other and without saying a word, turned off the TV, bathed the kids and spent time with our children before their bedtime. This is what I mean by saying you have the bravest show on television. Now, we love to read to our kids. I’ve been reading Shakespeare to my kids since the moment they were born (my four-year-old daughter asks for his stories by name). However, last night, our daughter surprised us and offered to tell us a story. So, we sat down on the couch and watched as our daughter told us (and acted out) the story of a young princess who got to spend the weekend with her fairy grandmother (she got to go to Memphis to see Graceland). We were treated to a precious mini-monologue about the entire adventure and her finally getting to come home to her Queen Mommy and King Daddy and to be able to play with her brother, the beautiful Prince. It wasn’t just a story, she relived the entire story for us in our living room. The best part is that it now only exists in our memories. I was completely caught off guard and didn’t have the time to get the video camera out to capture it (which is my normal impulse). I was able to capture another of her stories and posted it here. I swear I don’t know where she inherited her love for a good story or her absolute inhibition in front of an audience. I do know that the latter scares the crap out of me because I can flash forward 15 years from now. So, I am very blessed. And, I thank you for getting it. When callers call your show, some of them use the phrase “I get it.” The more amazing thing is that you get it and have the ability and bravery to share it with us every day. Thank you. Believe it or not, iTunes has decided to add me to their list of podcasts. I can’t promise that they will be posted with any regularity, but at least I’m listed so you’ll find me on your iPod under the podcasts menu if you decide to take it that far. You can always just come to the website and download the podcasts individually, you can also find me on iTunes. This icon, , will reside on the left menu bar. Understand that this is only for people who have iTunes loaded on their computer!! Those of you who really know me know that I love my gadgets. I have a cell phone with a bluetooth headset that I use almost more than the handset itself. I love my bluetooth headset. Not only that, but when our cell phone contract comes due in a couple of months, I’m going to be upgrading to a SmartPhone (which will, of course, have bluetooth capability). My question is this: How is talking on the phone with a hands-free option any different than carrying on any other conversation with someone who’s actually in the car with you? Why are cell phones more dangerous than having your kids in the back seat fighting with each other while you are driving? When are they going to outlaw electric shavers, farding, smoking, playing your car stereo, driving in the rain, or even driving if you are PMSing? Any of these would make just as much sense as the outlaw that’s prescribed above. I wish I could say that no one would hold anyone else responsible for any accidents that might happen, but we all know that it’s just a matter of time before somone gets involved in a car accident while farding or shaving who is going to turn around and sue the company who provided their distraction for not warning them about the dangers of using it while driving. Then we will start to see huge, stupid warning signs on packaging. I’m sorry, if you are too riddled with ADD to talk and drive at the same time, I want you out of the gene pool. Now. So, this summer in addition to all that other stuff I mentioned in that other post, I’m also playing Daddy Day Care for Morgan and Ian. The time I’m getting to spend with them is absolutely priceless. It’s also allowing me one other opportunity: cooking. That’s right. I’m turning into Betty Freakin’ Crocker. Have you seen Once Upon a Time in Mexico? No, really; there’s a connection. Hang with me. If you haven’t seen it, go out and rent the DVD. I’ll wait. There is a feature on it where director Robert Rodriguez takes you into his kitchen and, in 10 minutes, provides you with a recipe and shows you how to cook it. One of the pieces of advice he gives (at no additional cost) is to come up with 5 or 6 dishes that you really love and learn how to cook them – really well. Then, create a menu for yourself and keep it handy. When you have friends over, you can have them choose what they would like to eat and you can impress them with your ability to cook it! So, since I’m playing the part of stay-at-home-dad, I decided, I would take full advantage of it and teach myself how to cook for Bekah and the kids. So, tonight, when Bekah walks in the door in a few minutes, she’s going to be treated to stuffed green peppers. I’m getting more and more adventurous with my dishes and I’m going to track my successes (and failures) here. Stay tuned for updates!